Stop by our Texas Farm during picking season and treat yourself to some top-quality, locally grown berries. 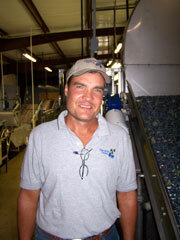 Alexander Blueberry Farms is committed to producing top-quality berries while maintaining sound food safety practices. Our food safety program is implemented all year, even though harvest lasts about 6-8 weeks. Every year at harvest we are third party food safety audited. We are constantly looking for ways to improve the quality of our berries. We harvest, grade, process, and package our own fruit. The grading, processing and packaging takes place in a grading facility at the Texas location. During the grading process, the berries move down a line of various machines which remove defective fruit. Employees at the end of the line are trained to remove any remaining defective berries. Only the finest berries are packaged for sale.